If your day is going too well then maybe you need a little more evil clown in your life. The evil clown has been a trope pre-Stephen King but everyone knows that no harlequins have ever done it better than good ol' Pennywise. Maybe it's something about being an ageless entity that's existed since the big bang. How an ageless entity ends up in a small town sewer, we don't know. He certainly does a great job at what he does and we have to commend him for that. 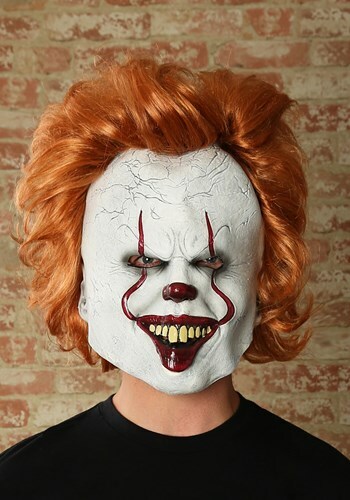 This mask couldn't look more like the revamped Pennywise from the 2017 release of "It". We're so happy we've never seen anyone hanging around our town in this realistic vinyl mask while we were children or adults. The mask has huge teeth, a red nose, and wild orange hair. Make everyone super uncomfortable with this wild mask. Doesn't that tasty, tasty fear hit the spot?